Tattoos have had their place in Andrew’s heart ever since he was a teenager, and he knew he wanted to be a tattoo artist while he was getting his first one in 2005. Andrew is very into the New School styles of tattooing and the plays on texture, proportion and color it involves. Color is like candy to him, and he loves to put it into his work as much as he can. 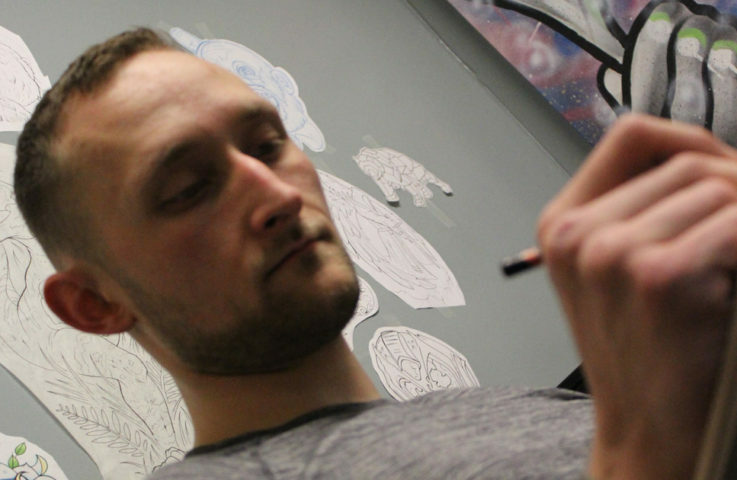 Andrew has an undergraduate degree in Biology, minored in art throughout college, and attended as many art classes as he could get away with. The relationship of science and art fascinates him. For work and play he paints, illustrates (medical/scientific/fantasy), graphic design, and draws. Andrew looks at his work like any skill and want to always push to be better through study and practice. He’s largely influenced by the styles/ideals of Da Vinci, Dali, Greg ‘Craola’ Simkins Jeff Maricola, and the tattoo styles of Timmy B, Andrés Acosta, and his mentor Keith Miller. Andrew began apprenticing under Keith in October of 2016, and working under him has not only made Andrew incredibly resilient, but also brought out a level of confidence, trust, and discipline in Andrew that has bettered him not only as an artist, but as an overall person. Rock climbing became a passion of Andrew’s in 2011. He is a personal trainer and loves to spend time working out in the gym, doing a lot of recreational outdoor activities, as well as playing music.